The best place to see Mt. 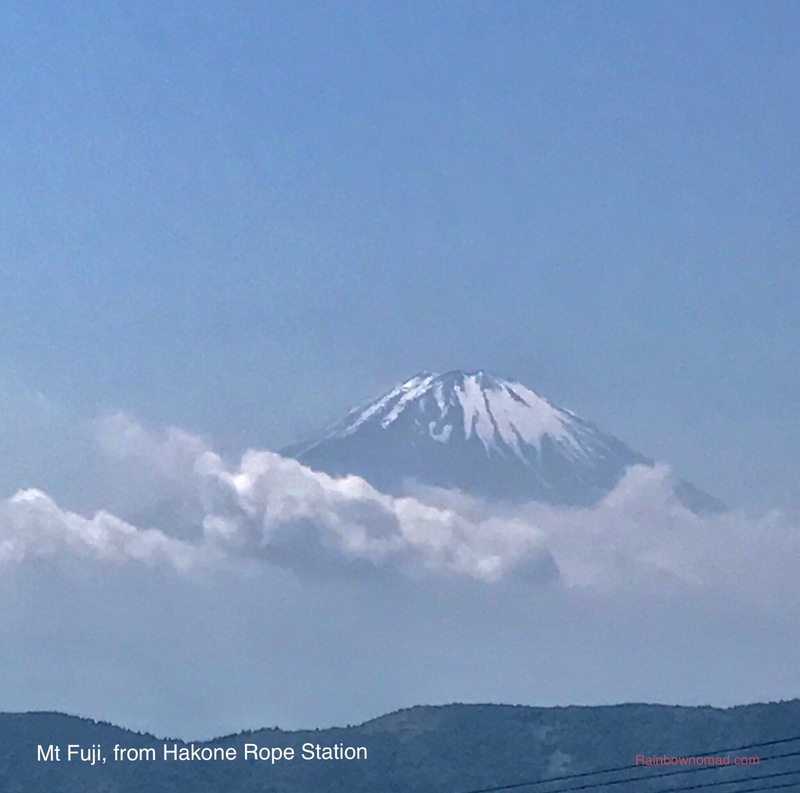 Fuji, if at all in June, is from the Hakone region, which is a two hour ‘slow’ train ride on the Odakyu line from Tokyo. We were prepared for the mountain to be hidden in haze or for it to rain, which is most prevalent in June. 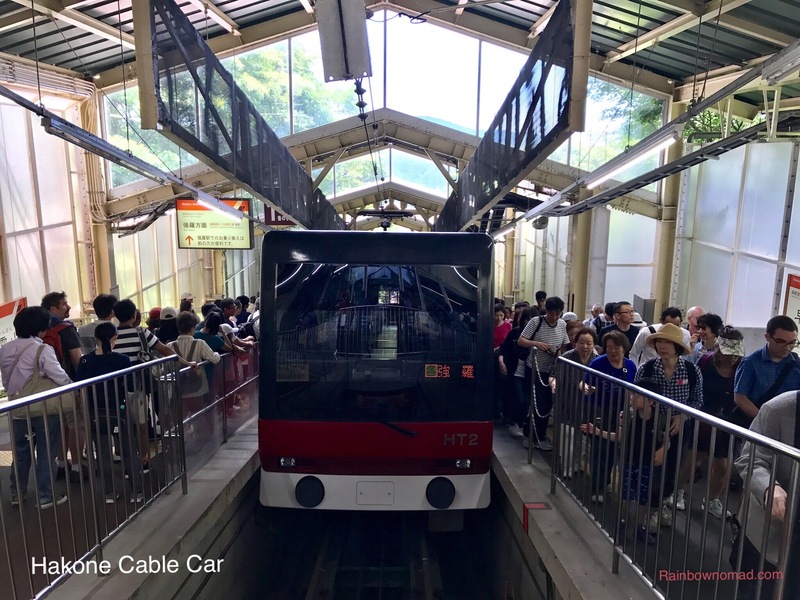 So we bought a 2 day pass, which included our train fare, and rides on a Hakone Tozan train up a switchback, a cable car, a ropeway over a sulphur crater and a sightseeing cruise and bus trip back to the train. 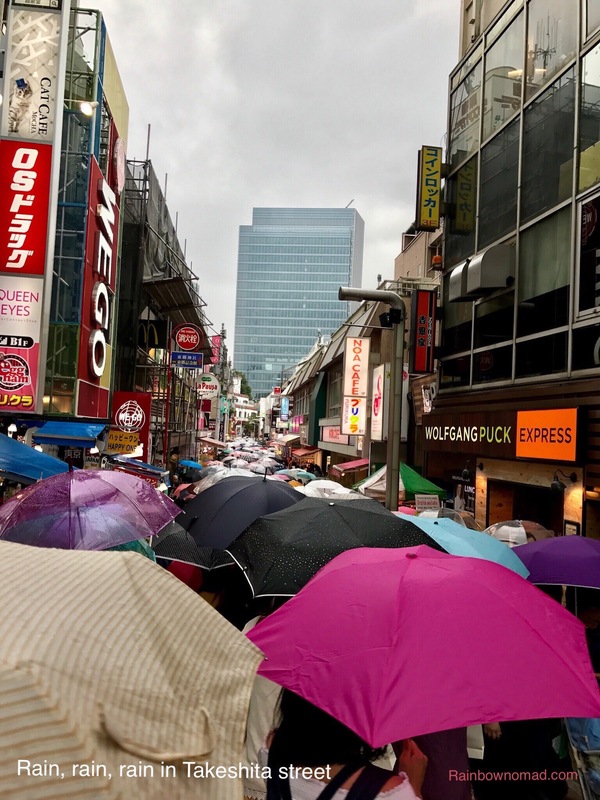 During the previous afternoon and evening it had rained heavily. Little did we realise that the rain had washed away some of the smog and haze and Lo and behold! on our train journey south, we caught glimpses of scantily snow clad Mt. Fuji in the distance. We were quite excited! Arriving in Hakone Yumoto train station, we transferred to the Hakone Tozen train, which runs on a single line transferring passengers up a steep mountain pass to Gora. 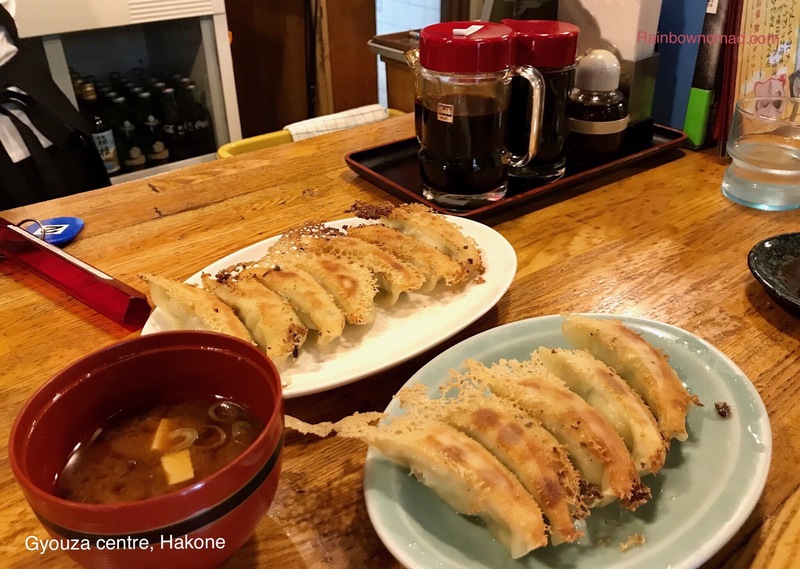 It was lunchtime when we arrived in Gora, so the expert travel advisor suggested gyouza, a wonderful grilled or fried dumpling, available at the Gyouza Centre on the side of the road, leading into Gora. We indulged in basic and squid gyouza, with soya and vinegar sauce and miso soup. 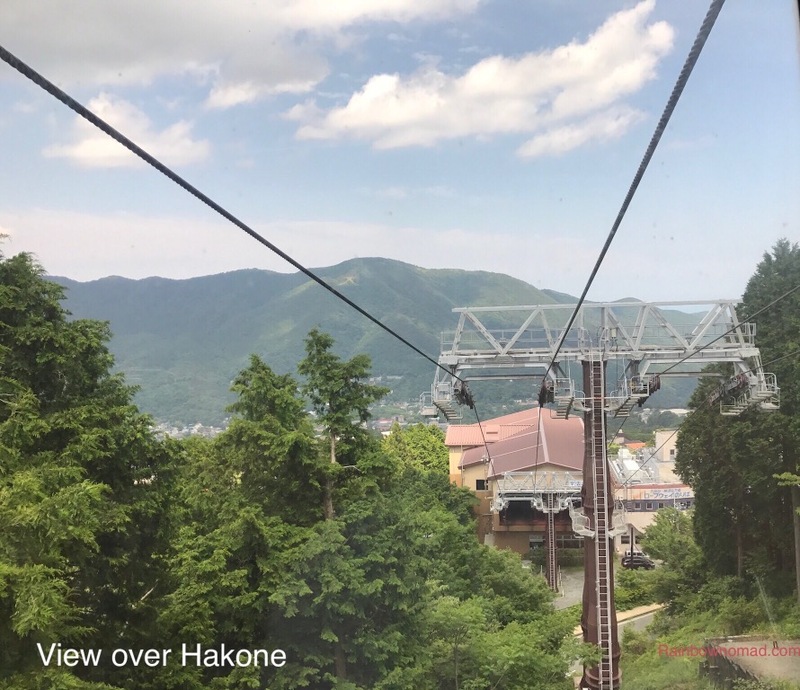 Feeling refreshed, we then tackled the cable car, which would winch us up to the ropeway – the cable car running on a rail and the rope way swinging us out over the valley on a cable to Owakudani, the ‘Great Boiling Valley’. The rope way took us over a crater, spewing yellow hydrogen sulphide smoke, the earth and trees burnt a khaki colour and smelling rotten. The crater was formed after the nearby volcano Kamiyama erupted and collapsed. As we entered the cable car we were handed a carefully wrapped wet towel. We were not sure if this was for nausea or as alternative smelling salts. 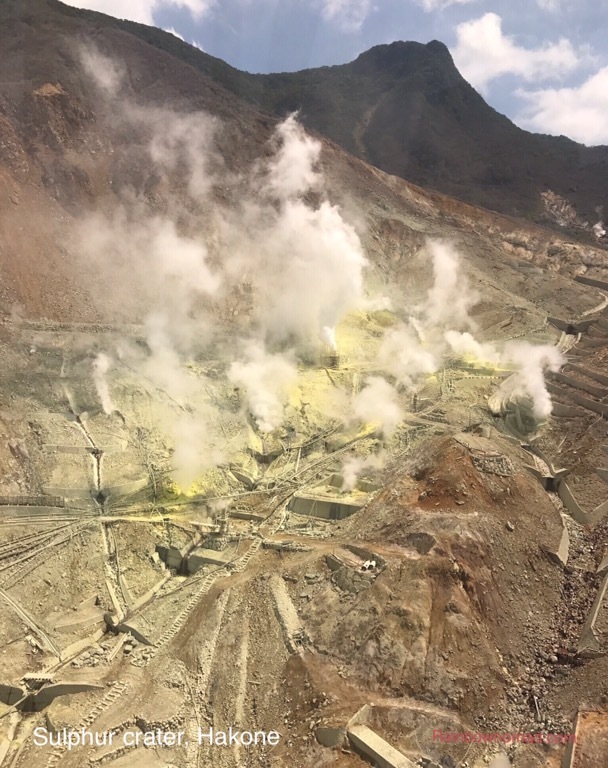 The crater was certainly a dismal scene BUT obviously the source of the onsen tamago or famous black eggs. 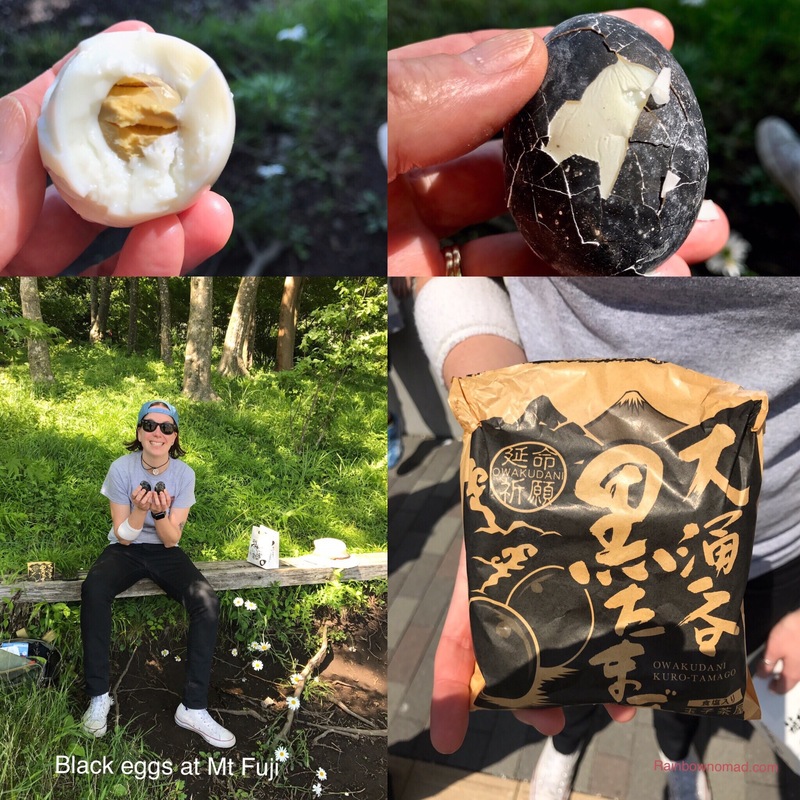 At the top of the mountain not only did we have a closer view of Mt Fuji, we could also purchase 5 black eggs, which we decided would make a tasty snack, while waiting for our pirate ship to arrive. Our map indictated that the best viewpoints for Mt Fuji were at the end of Lake Ashi on our sightseeing cruise but alas, the haze was back by 3pm. 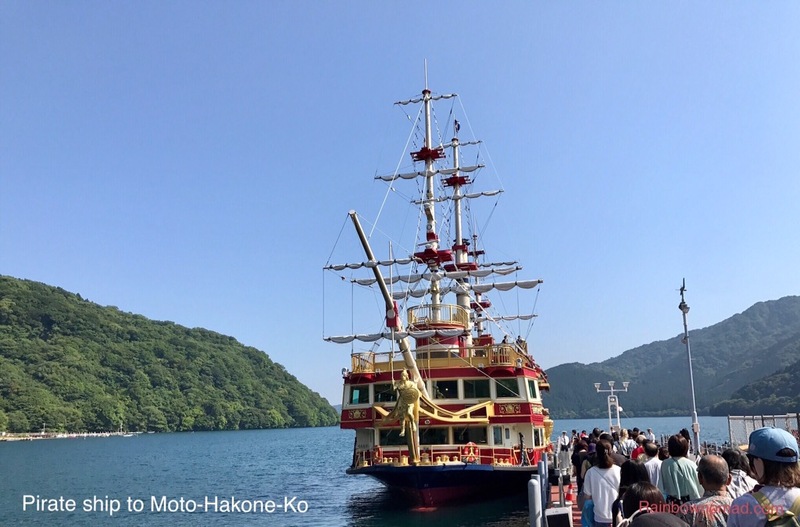 Our pirate ship had arrived so we enjoyed a leisurely cruise along Lake Ashi. 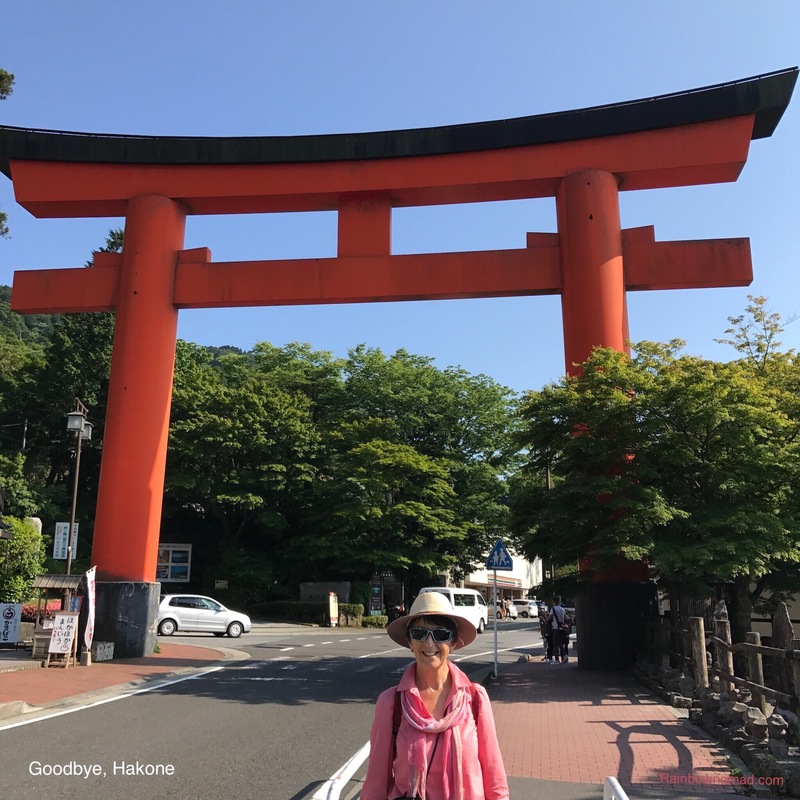 We piled off the boat through the torii gate at Moto- Hakone-Ko onto the bus which drove through massive cedar forests back to our train and crazy Tokyo.